We offer a full line of portable and permanently installed monitoring systems. Each systems designed specifically for your requirements, so for whatever your data collection needs, simple data logging, pH, Chlorine, Biofouling, all the way up to our microprocessor based ChemDACS® systems, and all points between, we can give you reliable direct or remote access to your data, when you need it, where you need it. 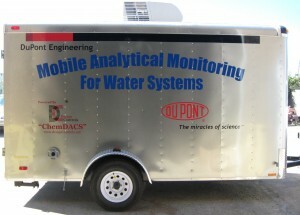 The ChemDacs (Chemical Data Acquisition and Collection System) Portable Monitoring System provides real time local monitoring of all of the process variables described below as well as data logging of the same. Data logger has a maximum storage capacity for 45 days worth of storage and can be exported to a PC via the skid mounted RS-232 connection port. Protocol for this data is in the CSV (comma separated value) format for easy importation into Microsoft Excel. Additional Monitoring Capabilities Activities based monitoring of treatment chemical is available. Two (2) inputs are available for monitoring make up water flow and blowdown flow. The flow meter signals for these units would need to be supplied by the plant if desired.